Home Bodyworks Laser Therapy New South Wales Sydney Region North Shore - Lower Neutral Bay How does laser tattoo removal work? Let’s first understand how tattoos work. The tattoo pigment is placed in the Dermis. This is the deeper layers of the skin, and the ink particles cannot be absorbed by the body here. This makes the ink permanent. 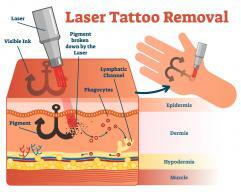 Tattoo laser removal works by directing the laser light onto the tattoo. The laser light is set at wavelengths depending on the ink colour. Black ink is the easiest to remove or fade. Reds, blues, and greens can take a little longer. The tattoo ink absorbs the laser light, and the ink particles are shattered into tiny little particles. The shattered ink is then eliminated through the lymphatic system. This is the body’s natural cleaning system. Every tattoo is different, and so is every individual. If the person is healthy, their immune system and lymphatic system is healthy, therefore the process is quicker. Generally, it takes 6-10 treatments to remove or fade a tattoo. However, this can vary on several factors, the health of each individual person, type of tattoo, amount of ink and colour. Removal or fading of a tattoo, is like peeling back an onion skin, we can only treat one layer at a time. It’s advisable to wait at least 6 weeks between each treatment. The ink elimination process takes time. We recommend this amount of time so we can achieve the best results.